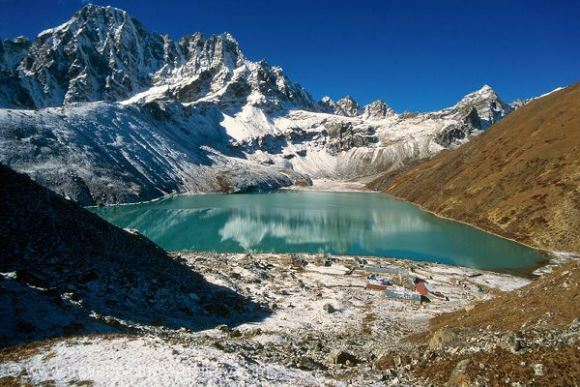 If you have a few extra days to spare the Everest Base Camp via Goyko Lakes trek is a must do. This longer more adventurous version of the classic Mount Everest Base Camp Trek will take you to the top Gokyo Ri to the emerald Gokyo Lakes, cross the Cho La pass, ascend Kala Patar and EBC, this route guarantees unspoiled mountain scenery. Our carefully prepared itinerary reflects our proven track record permitting ample time for a safe acclimatization, the key to any successful trek in the Everest region. The trip begins and ends in colorful Kathmandu, Nepal where you will take an exciting flight to/from Lukla then ascend to the vast glaciers of the Everest Himalayas. Accommodations along the way are in teahouses and meals are “a la carte,” allowing you the flexibility to eat what you want. Our guides are trained and licensed by the Nepal Mountaineering Association to ensure you have a safe and enjoyable trek. In addition, Nepal is home to some of the friendliest people, the most beautiful scenery on the planet and a variety of cultural traditions. Ready. Set. Escape! 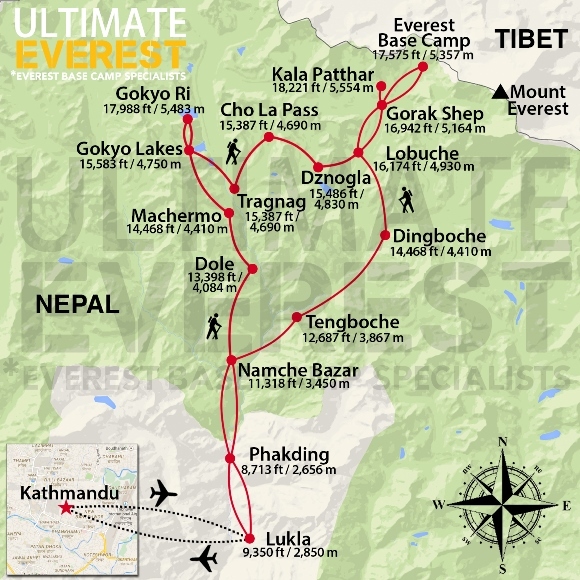 The world famous Everest Base Camp via Goyko Lakes Trek awaits you. Today will be spent in Namche Bazaar to acclimatize and prepare our bodies to push higher into the Everest region. The village offers shopping opportunities as well as several lodges. It is a great place to spend a day before heading towards Dole. After a nice rest in Namche Bazaar, the days trek will be spent on a series of switchback trails to the Dudh Kosi River at Phortse Bridge. We head towards Mon La pass, where the trail climbs steep through rhododendron and birch forest until finally reaching Dole. Machermo is a short trek from Dole and the trail climbs steadily hugging the side of the valley. As we trek higher in elevation the alpine scenery becomes dotted with only small clusters of scrub juniper but the route offers beautiful views of Cho Oyu, Kantega and Thamserku. We will spend a day in Machermo to acclimatize. There are many opportunities to explore around camp and above the village. Ascend the hill above the settlement to the North or you walk up the valley towards the West following the Machermo river. A short steep climb starts the days trek which leads from the Machermo Valley thru the terminal moraines of Ngozumpa Glacier. A steep rocky incline leads into the valley by the side of the glacier and passes the first of the holy lakes. Gokyo is surrounded by stone walled yak pastures and offers a stunning backdrop as Cho Oyu and Gyachung Kang’s massive summits reflect in the emerald green waters. The days trek starts with a steep climb up Gokyo Ri. This towering peak sits above the village on the northern edge of the lake where panoramic views of Everest, Lhotse and Makalu come into focus. After lunch we begin our trek to Tragnag. The day begins with an early start to cross Cho La pass and the long descent to Dzongla. It's a rocky scramble to the pass, the trail continues up the valley crossing a ridge and a lateral moraine that includes steep glacier traversing. After crossing the pass the trail descends steeply towards Dzongla and offers exceptional views of Kyajo Ri, Tengkangpoche, Numbur, Kangchung, Ama Dablam and Cholatse along the way. From Dzongla we continue our decent through the grassy landscape to Lobuche. Today’s trek starts by following the broad valley which runs parallel to the Khumbu Glacier and a stop for lunch in Gorak Shep before reaching Everest Base Camp itself 17,575 ft (5,364 m). This trek takes roughly 3 hours’ time, as it navigates through ice pinnacles and crevasses. On the return, you can take a higher route for spectacular views of the notorious Everest Ice Fall that flows from the Western Cwm. Overnight in Gorak Shep. A demanding hike to the top of Kala Pattar 18,221 ft (5,554 m) will begin early. The views from Kala Pattar are breathtaking, here you can gaze upon Everest and look deep into the Khumbu ice field. After photos are taken we will descend to Dingboche where we will spend the night. The last day of trekking follows the Dudh Koshi River from Namche Bizarre back to Lukla. This is an ideal time to reflect on your trekking experience and celebrate your great achievement.